If you've ever been to Ontario, Canada you've passed by lots and lots of Tim Hortons donut shops. They are everywhere. About as common as Starbucks in Los Angeles. They aren't all that great but I get a warm and fuzzy feeling when I enter one because they are distinctly Canadian. In case you're wondering, Tim Horton was a Canadian hockey player who died in a car crash way back in 1974. Sadly he never saw how famous his name became. As you might expect, this chain of stores serve a lot of donuts and one variety is called the dutchie. 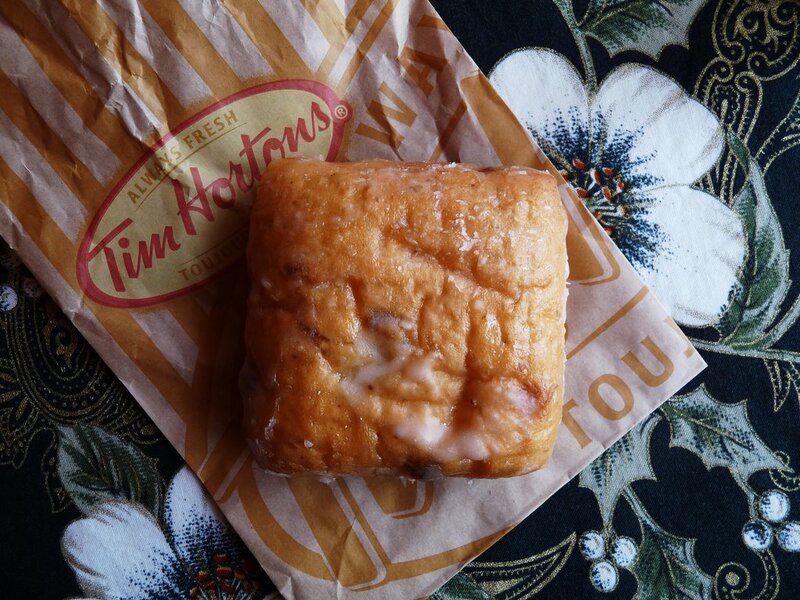 It is a square glazed donut with raisins. I was a little disappointed on my last trip to Canada because the dutchies at Tim Hortons have become a lot smaller and not quite as appetizing. But a donut is a donut and just like pizza, even when it's bad, it's still pretty good. Here is the last dutchie I ate. When some people hear the word "dutchie", they think of that eighties song called Pass the Dutchie by Musical Youth. For years I thought that a dutchie in this context meant a joint but after a little research, I found out that it likely refers to a cooking pot. However, the original song on which this song was based has definite drug references; there is no question that Pass the Koutchie refers to sharing a cannabis pipe. But whether you have a Canadian Donut, a Dutch cooking pot or a Jamacian pipe, I think you should still pass it from the left hand side.